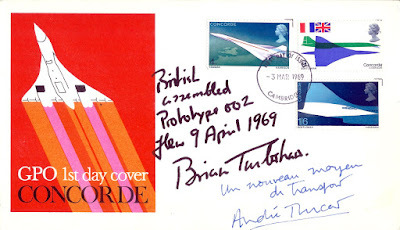 Signed by Brian Trubshaw, who was the leading test pilot and the first British pilot to fly Concorde. Signed by British and French chief test pilots, Brian Trubshaw and André Turcat. On March 2 1969, Turcat and his French crew took off from Runway 33 at Toulouse in Concorde 001 on the aircraft’s maiden flight. As the test programme for 001 gathered momentum, Turcat invited Brian Trubshaw, BAC’s chief test pilot, to accompany him on 001’s fifth flight, providing valuable information for Trubshaw before he flew Concorde 002. Trubshaw made the maiden flight of the first British Concorde 002 on April 9 1969 at Filton, Bristol, where it was assembled. 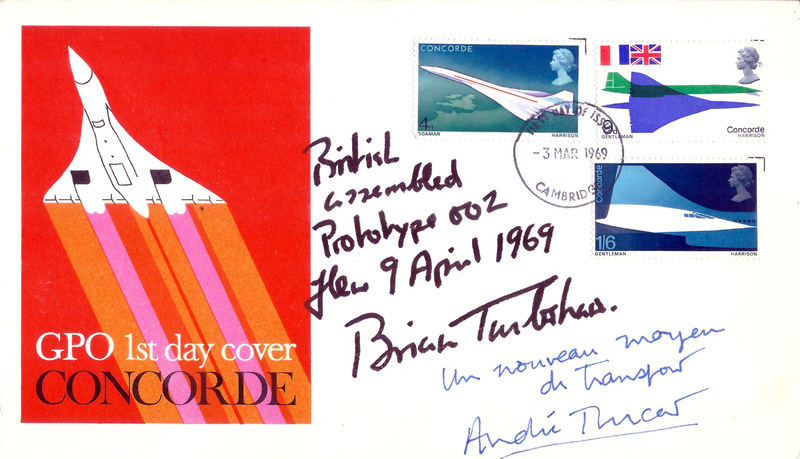 This cover was carried on Concorde-002 during a test flight, signed by Brian Trubshaw.